prosciutto lasagna with angry sauce. Earlier this week, I decided to tweak my mother’s amazing lasagna recipe in order to include some ingredients that I’ve been loving lately. Here are two things I’ve been obsessed with since honeymooning in Italy: prosciutto and arrabiata sauce. Prosciutto, according to Caitlin Fitzgibbons on HelloGiggles, is “like ham that went to university abroad — sophisticated and cultured.” Love it. Arrabiata sauce is spicy red sauce. I learned in Italy that arrabiata actually means angry! The Italian language is so beautiful. 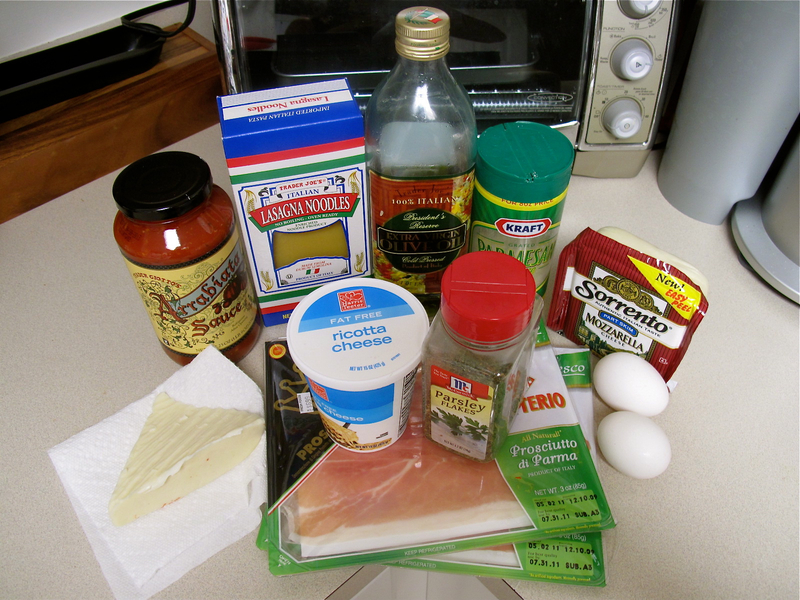 So here is a rough recipe of my Prosciutto Lasagna with Arrabiata Sauce…. Apply a thin layer of sauce at the bottom of the pan. Alternate blobs of ricotta mixture (which is ricotta mixed with the eggs and parsley) and mozzarella across noodles. Add sauce on top, just to cover, along with proscuitto. Sprinkle parmesan. Repeat layering order, ending with sauce and some parmesan cheese on top. Cook for 30 minutes (covered in foil) at 350 degrees. Let cool, and enjoy! 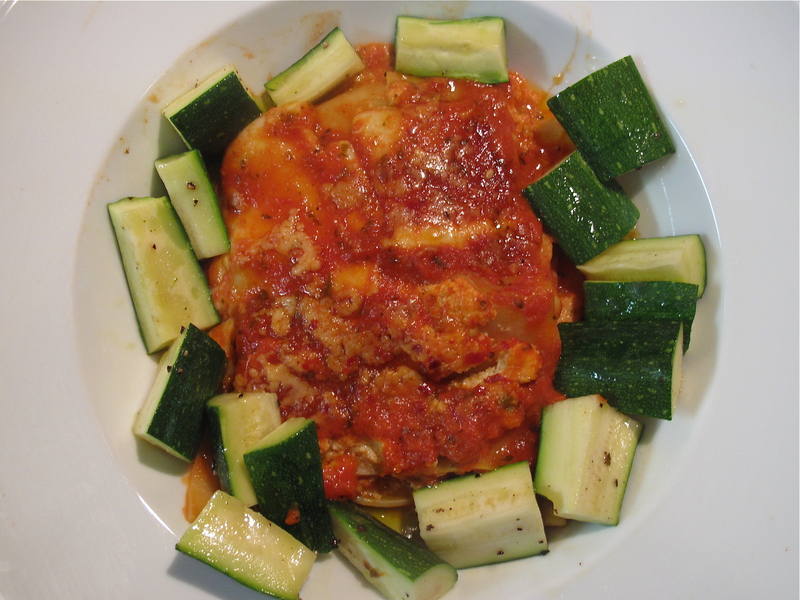 Prosciutto Lasagna w/Arrabiata Sauce + Zucchini. Last weekend (not this past weekend, but the one before), I made my favorite casserole for our friends who just had a baby. 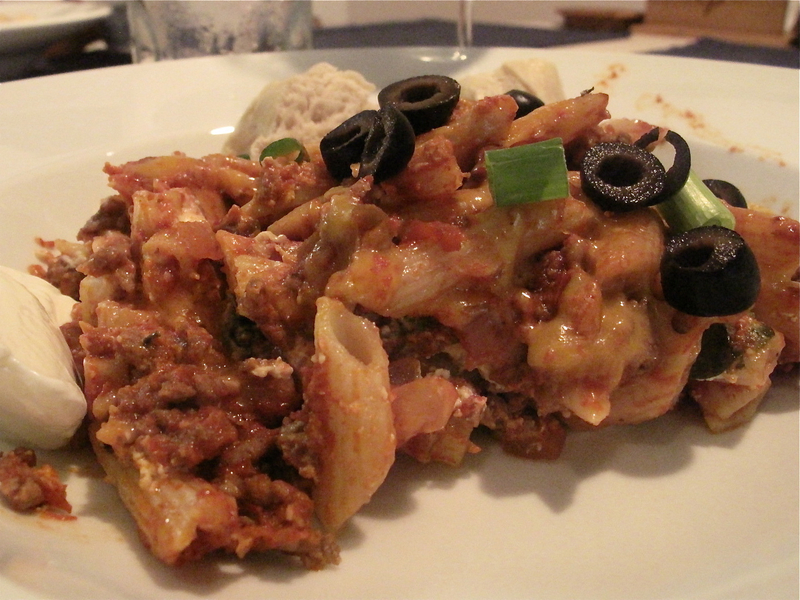 Here is a link to the recipe for the Southwest Pasta Bake…. I just call it “Mexican Lasagna.” Tired of making the same old boring casserole? Here is something that will wow your audience. I made extra to enjoy with my dear friend Arielle, who was in town from Seattle. We had a yummy South African Sauvignon Blanc (wine maker: Zafrika) from Trader Joe’s, which complimented the meal nicely. That’s Mexican rice in the crockpot, that our friend Sarah brought along. 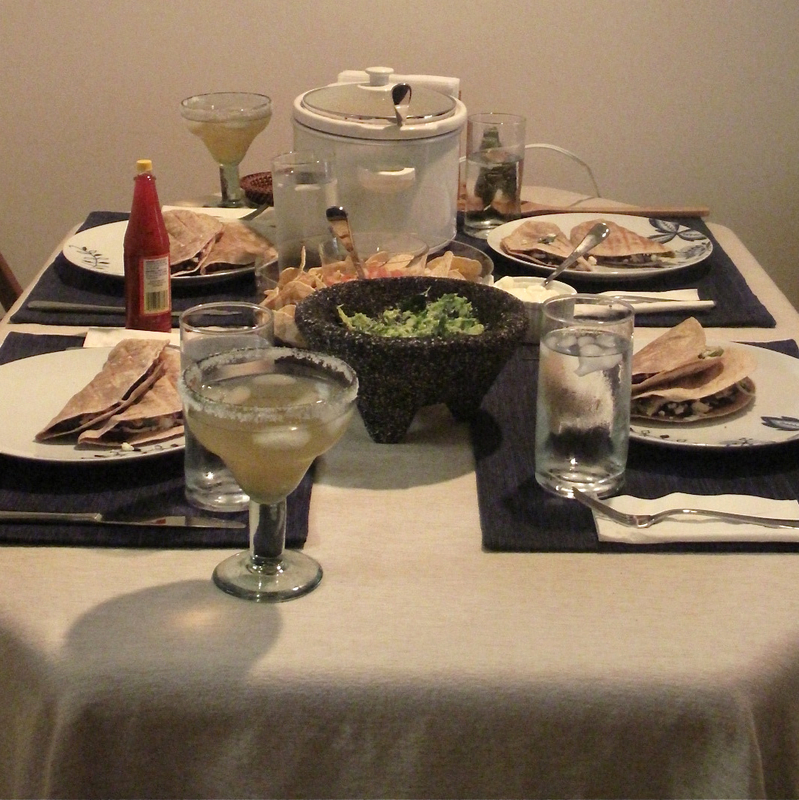 I promise I will post the amazing margarita and guacamole recipes at some point! A staple for Chris and I’s food life. Tonight, I made similar quesadillas (with tomatoes added and pepper jack cheese, instead of feta). 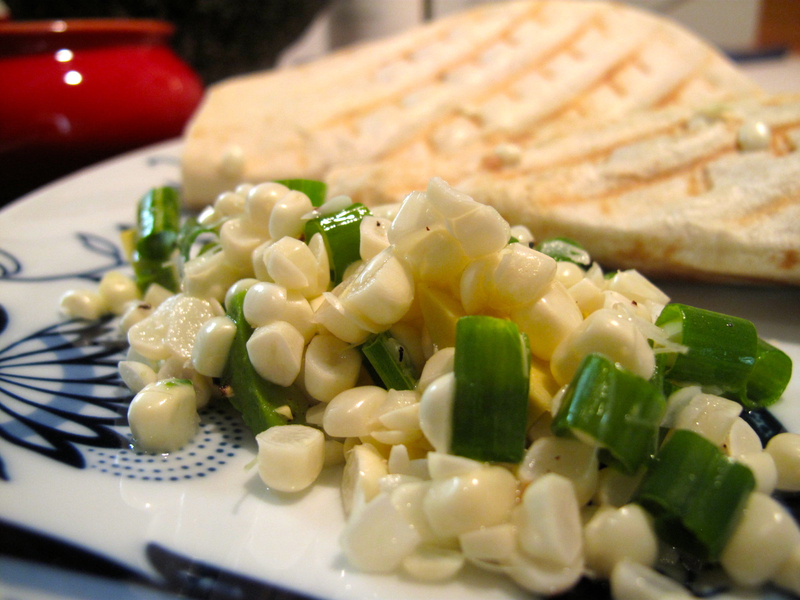 I also wanted to share this Corn & Avocado Salad, from this month’s Real Simple issue. Light and easy! I used green onions instead of scallions.